In the midst of National Assisted Living Week, which begins on Grandparent’s Day each year, Heritage Communities is excited to announce the rollout of their new book, In a Good Place. Members of Heritage Communities’ Executive Leadership Team, Nate Underwood and Lacy Jungman, joined forces on this year-long project, which highlights the journey of an adult daughter’s search for senior living for her aging mother. In a Good Place is a fictional story based on the thousands of families Underwood, Jungman and Heritage Communities has helped over the past 15 years in the senior living industry. On October 11th, The Heritage at Legacy on 168th & Center in Omaha, will be hosting a book launch event where readers can get an advanced, complimentary copy signed by the co-authors. 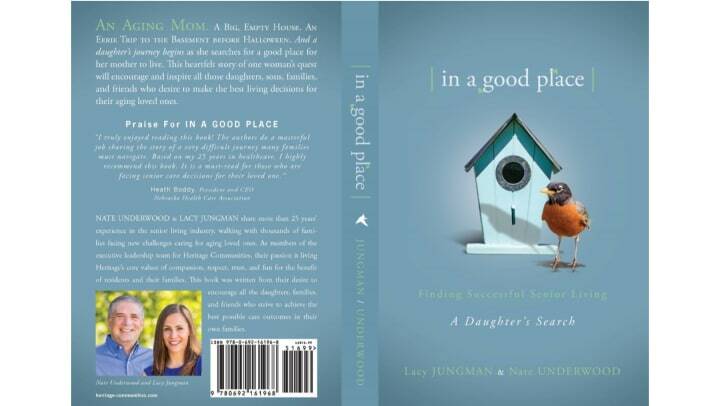 Additional copies of In a Good Place will be available in late October at all 12 Heritage locations. To request a complimentary copy, please reach out to a Heritage Communities location near you, or call the Heritage Communities home office at 402-933-2561.